If “home” is Minnesota, and “abroad” is transcontinental, but also reaching across historical eras, then At Home and Abroad is aptly named. A captivating and varied (not to say ravishing and sprightly) collection of music for violin/viola and guitar, the album features works dedicated to the Shank-Hagedorn Duo by Alf Houkom, Javier Contreras and David Lang; first time recordings of works by Ian Krouse and David Hahn; and the Duo’s own arrangements of music by Maria Kalaniemi. 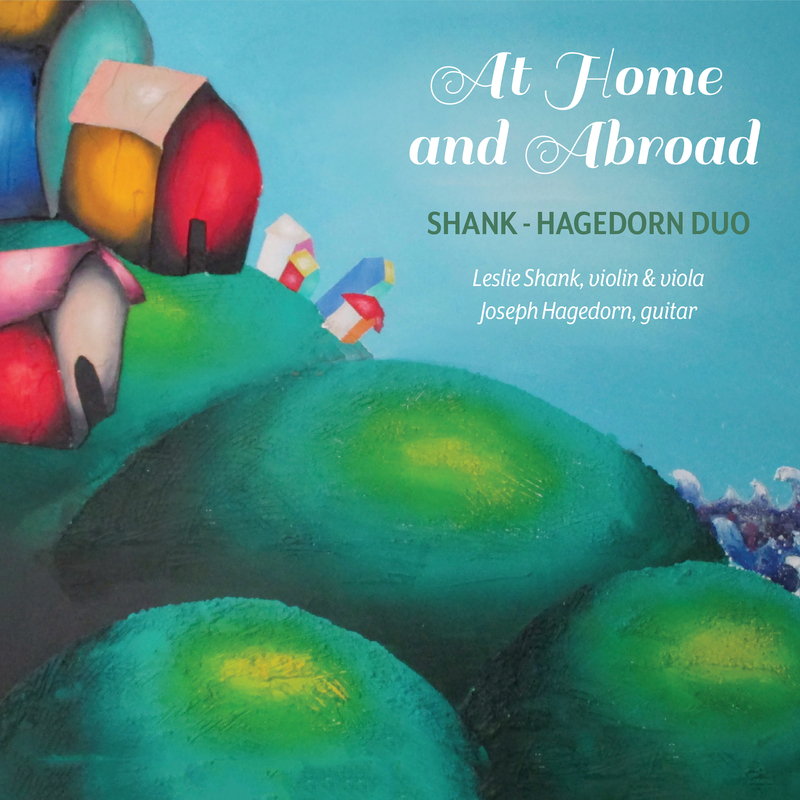 For this release, violinist and violist Leslie Shank and guitarist Joseph Hagedorn have selected some favorite works from their past fifteen years of performances. The music is as wide-ranging as the Duo’s interests, with influences from South American and Finnish folk music to John Dowland and “Pop Goes the Weasel”. "METEMPSYCHOSIS – The contemplative final movement recalls the insistent theme of the first. ‘Metempsychosis’, a word significant in James Joyce’s Ulysses, means the ‘transmigration of souls’. This movement pays homage to all those – especially the children – who continue to suffer and die in war. The last few bars, where the instruments gradually ascend in pitch, are intended as an apotheosis – a technique taken from the Baroque tombeau (a musical elegy), in which ascending pitches symbolically carry souls to heaven." Praised by the New York Times as “an impressive violinist [who plays] intimately and sweetly at one moment and with fearless enthusiasm at the next,” Leslie Shank leads a busy musical life as soloist and chamber musician. She was a member of The Saint Paul Chamber Orchestra for 30 years, 24 of them as assistant concertmaster. Soloing frequently with The SPCO, she also performed with the Concerto Soloists of Philadelphia, the Seattle Symphony, and the National Orchestral Association, among others. A founding member of the Minneapolis Guitar Quartet, Joseph Hagedorn has performed with the group since 1986. In 1990, he was the winner of Guitar Foundation of America International solo competition. Hagedorn has served on the music faculty of the University of Wisconsin-River Falls since 1988. He has been heard twice on the nationally broadcast radio program Saint Paul Sunday, once with the Minneapolis Guitar Quartet and once with his wife, violinist Leslie Shank, as the fretted half of the Shank-Hagedorn Duo. His adroit, colorful arrangements, numbering in the dozens, are widely admired.